What is Joatmon Computer Repair? 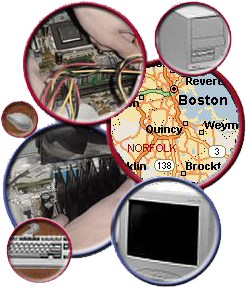 Joatmon Computer Services has established a computer maintenance and repair shop located in Canton, MA. Providing a wide range of services including hardware and software installation, upgrades, and system rebuilds for both residential and commercial clients. Servicing the Boston South Shore and surrounding areas. Just as your car needs regular maintenance to perform at peak efficiency and provide many years of service, so does your computer. The installation and removal of software, web surfing, and playing games all take a toll on your PC. Joatmon Computer Services will help you keep your computer running efficiently. If you are experiencing problems with your system, related to Internet service, problems dialing up, checking e-mail, hardware problems or 'it's just not working right' and you are in Joatmon's customer service area, you can contact Joatmon's support staff by phone at 781-363-0370 or by e-mail at support@joatmon.com.